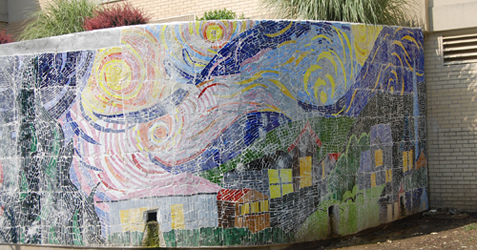 For the past three years, art teacher, Teri Hay, and her ceramic, commercial art, and fine arts students have been working to beautify the courtyard outside of the high school auditorium. Using broken pieces of glass, the students are slowly putting together a mosaic of Vincent Van Gogh’s Starry Night. Completion of the mosaic is scheduled for the end of the 2010-2011 school year.